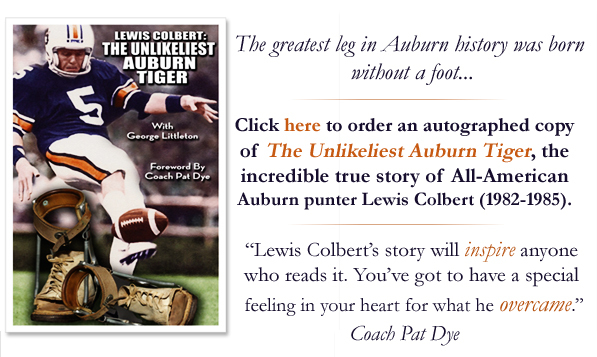 Maybe it was the altitude, or the free Delta liquor, or maybe he really was enrolled in Auburn in the late 70s. David wasn’t on the flight—his dad Tom, a 1960 graduate of Auburn, was. “Dad traveled a lot and would often run across ‘celebrities’,” Bivin says. I was on an airplane with Bear Bryant..coming back to B’ham from NYC I think. I sat with him for a while and told him you were a big Auburn fan but you would love to have his autograph. He wrote this note for you (I thought on a napkin but obviously Delta paper). After he wrote it, I asked would he just put “17-16” after his name…”Hell No” was his response (with a smile). This was the same trip that I noticed he had gem clips to hold up the cuffs of his new suit. Said he didn’t have time to get them hemmed. Dad’s advice to son? eBay. Related: Party For the Retirement of Bear Bryant. Interesting. I have a framed photo of Bo that was signed by Bear. It was a pic of Bo in the ’82 game when he dove for the goal line with Tommy Lewis hanging on for dear life. Bear must have enjoyed signing Auburn stuff. I think it referred to the fact the BEAR OWNED AUBURN!! Not to be nit-picky, but you state that the note was written on May 5, 1977; but the note itself says 5/4/77… Wouldn’t that be May 4, 1977? I think this is fantastic and shows how far we, as a society, have digressed since then. I bet Shug would have done the same thing; which is to be nice to another human being. That’s all bear was doing here. Being nice to a fellow traveler and a child, who he’d NEVER meet. I think it’s awesome. And don’t sell it… It’s true, there probably aren’t any other notes that talk about “our Auburn team” but there is only one note to David. That’s pretty special, too. Maybe we haven’t digressed so far. I think both Gene Chizik and Nick Saban proved that by their actions and the actions of their teams after the tornadoes earlier this year. Not to mention addressing the Toomer’s Oaks poisoning as the crime that it was. After the current series of calamities and scandals in the Big 10 and ACC, I am confident that at least these two particular coaches would act appropriately. *You have no idea how hard that was to type! In the early 80’s my brother John and I owned a couple of hardware stores and we won a statewide sales contest put on by Joe H Brady Company of Birmingham for being one of the top ten Kerosun Heater dealers in the state. Coach Bryant was the spokesperson for them for a couple of years and the prize for winning was for all of us to have dinner with the Bear at the North River Yacht Club in Tuscaloosa. Before dinner everyone got to get their picture taken with Coach Bryant so when it came our turn and as we went up for the picture someone said “those are Auburn boys coach”. In a deep low growl Coach Bryant smiled and said “that’s alright, that’s one of my favorite places”. So, who knows, maybe Bear did have a soft spot for Auburn. Cortés probably said the same thing about Tenochtitlan… and it didn’t make the Aztecs feel any better. sullivan013 – I totally agree with your comments. Jim – I know who you are! Bob, what an AUsome memory! Thanks for sharing it. I’m an Auburn alumnus and fan. While it sounds like a great story I don’t believe it. The note doesn’t make sense for a couple reasons. If you compare the word “our” to the rest of the script it clearly starts with an “a” not an “o”. Also the word Auburn isn’t the same size as the rest of the text and doesn’t even appear to be the same handwriting. I don’t have a good explanation of what it meant to say even if it is real but it just doesn’t look legit. I hate to disappoint, but I can assure you it’s not fake. 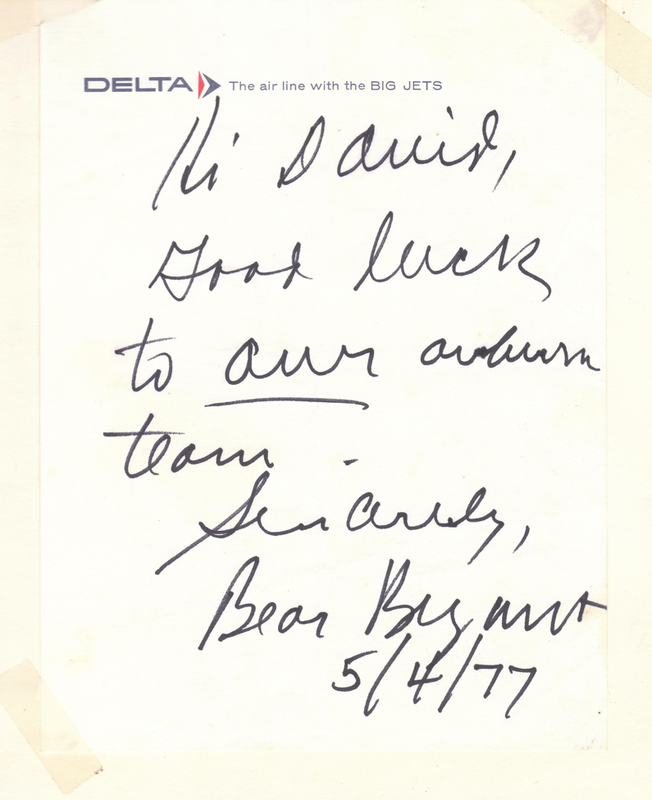 If you don’t like Bear’s handwriting, you’ll really hate Rocky Graciano’s (on the back of a Delta itinerary card). You know, Bear Bryant was probably a lot more civil about the AU/UA rivalry than the current crop of Gomer rednecks that call themselves Bama fans. ya’ll are right – Sabin really is a helluva swell guy!!!!!!!!!!!!!!!!!!!!!!!!!!!!!!!!!!!!!!!!!!!!!!! My parents, mother-in-law, uncles, aunts, grandmother, great aunts, God parents, friends, colleagues, neighbors, etc. were all buried at Elwood Cemetery in Birmingham. My kids, now in their 20’s, can attest to the fact that every time we went into Elmwood to go to a funeral, visit a grave or to collect mistletoe for my son to sell to our neighbors, I took my children to visit Paul Bryant’s grave to pay our respects. He was the greatest football coach of all-time. I wanted my children to know that their father had respect for the man that coached Alabama to nine straight wins over Auburn, my alma mater, Class of ’75. This note to David proves that “Bear” had the “class” that is so lacking today. “Bear” probably wrote many such notes to Auburn lads and lassies; after all, he always acted as if he had been there before. “Shug” did, too. I have a picture of Bear Bryant on the wall beside an autographed photo of Tucker Fredrickson. The photo of Coach Bryant is one of him with my uncle who was bedridden with MS. I love Auburn but Coach Bryant was very kind to my uncle in Northport. He’d come by and visit frequently and talk to him. He sent him a copy of his book and signed it “Here’s a copy of my new book. Hope you are feeling better and I hope you enjoyed the pie mama baked. – Paul” My family was privileged to know Coach Bryant away from football and, warts and all, he was always a class act. This Auburn fan will always have a special place in my heart for him, cow college remark or not. I’m a Fan of Both ! Im Glad we’re try n 2 get alone somewhat ! !